I’m not usually the type to go hit lots of garage sales or antique shops, mostly because I usually don’t have the patience or the money. 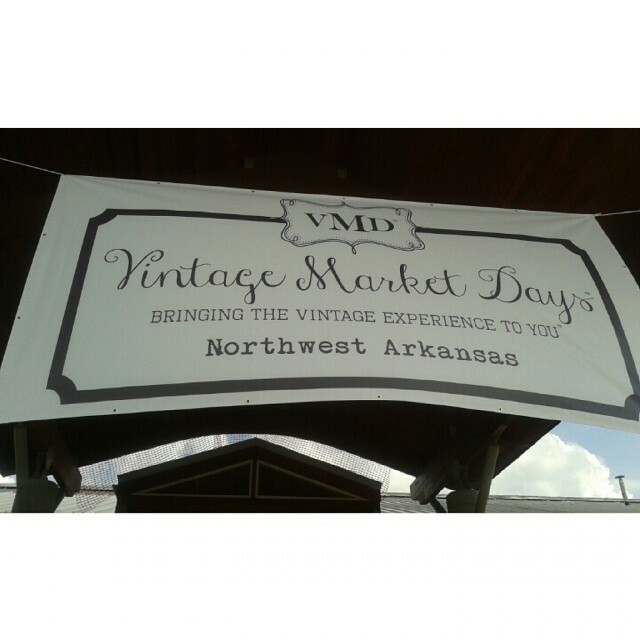 I had been hearing about a new event in Fayetteville called Vintage Market Days of Northwest Arkansas and I was intrigued. Let’s just say I was pretty excited when friends John and I were making plans with said it’s where they wanted to go. We had fun looking at all the wares and there was at least one item I had to put down several times to avoid buying it. There were some wooden crosses that were beautifully and rustically painted and adorned. I know exactly where one would go in our living room! There were also these adorable vintage style baby turbans (from Baby Turban) that were so cute but all the littles in my life are a mite too big for them. There was also some weird stuff like this shiny empty turtle shell. This headband is made from a vintage cloth ribbon sewn together intertwined with a ponytail holder. It’s from a local company called Vintage Violent. It’s so pretty! They had very few food vendors (I think just one or two) but we stopped at the one for Ella’s, which had all kinds of dips available. We got the 3/$10 sale and I can’t wait to make these. My absolute favorite thing is this planter. It’s going to go on our front porch. I’ve been wanting flowers in the front but needed something low maintenance. I have a thing for container gardening so this was a perfect fit (plus is was 40 percent off because it was the last 2 hours of the weekend sale). This event was a first time thing for NWA but I hear it was so successful they are coming back in September. I just might save up and get one or two items! I love how we live in an area that has such variety in its activities and plan to share more about them on this blog. Awesome! I really wanted to go to this, but I’ve been out of town shooting a wedding. Maybe I can make the one in September. 🙂 Thanks for sharing your finds! I couldn’t believe it was their first event! Very well organized from my perspective. Was not crazy about the dirt floor but aesthetically it was part of the charm. I love that planter, Jamie; such beautiful flowers for your porch! And the headband and those tags, especially the saying on the Yellow Brick Road tag. I may have to make a fun printable with that saying and hang somewhere. :) Thanks so much for sharing on Inspire Me Wednesday. Featuring you in this week’s issue. Thank you! When I get it all set up I will take another picture and share it. The Yellow Brick Road one was my favorite tag. Thanks SO much for letting me link up to your Inspire Me Wednesday! I found you via Instagram, so I’m a new commenter. This weekend is the Farm Fresh Sale at The Junk Barn in Prairie Grove. It’s very much like Vintage Market Days, but the prices will be much lower. It’s on Centerpoint Road in PG. You can see it on Facebook as Farm Fresh. Live music, Ballet food truck, cupcake truck and over 60 vendors selling vintage wares. It’s going to be great! I am a local small time vendor and it is a lively venue. Come on out! Shara-thanks for commenting! I think I follow them on Instagram but if not, I will. I don’t know if we can make it out there for this event, but I will see and definitely share about it!